Report Google docs abuse if you find spam or other unwanted information in public Google docs. All Google drive docs allow users to report Google docs abuse through each individual doc with Google reviewing these reports before taking action on the Google doc and the Google docs creator. 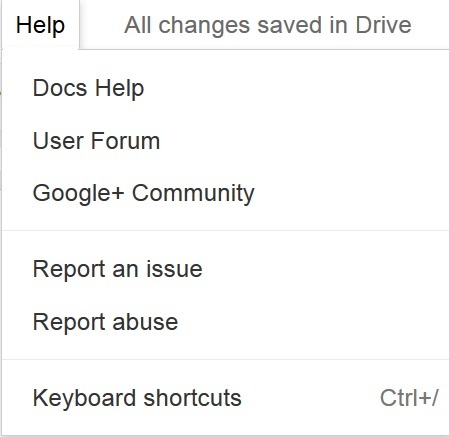 If you want to report Google Docs abuse, follow the simple guide to report Google Docs abuse in Google Drive. 1. Open the Google Drive file you want to report. It can be a Spreadsheet, Document or Presentation. Click on the Help Settings and click on Report abuse. 2. Choose the best option you want to report Google Docs Abuse for. Be sure to read the guidelines for each report type before submitting Report Google Docs abuse. Google drive has become an integrated cloud platform allowing users to create document, presentations, spreadsheets and more conveniently storing these files in the cloud. Google drive enables users to store documents in the cloud and empowers them to access these documents from any device. With the increasing popularity of Google drive more users are creating and storing documents in the cloud. This enables public documents and can be used to create phishing, spam and other unwanted abuse. Google docs and Google drive in general give users plenty of options to report Google docs abuse. The help feature in google docs enable users to report Google docs abuse. The most effective way of reporting spam on services like Google and others social networks has been crowdsourcing the process of identifying spam to its users. When users report Google docs abuse, Google specifically asks users if the abuse is related to inappropriate content, copyright infringement or general scams and this helps a company like Google identity and classify spam in general.